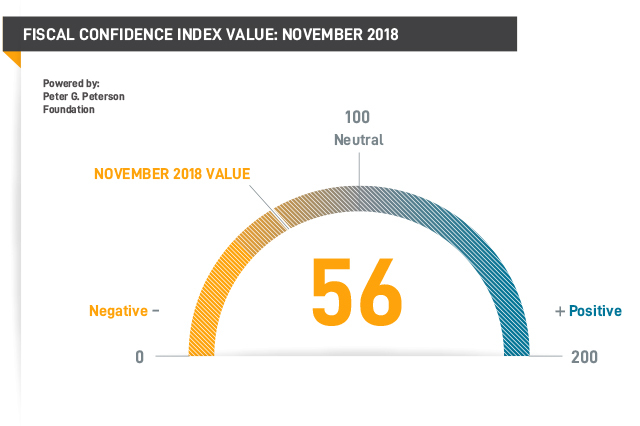 Topline survey results from the Fiscal Confidence Index for November 2018. The FCI value for November is 56. The Peter G. Peterson Foundation commissioned this poll by the Global Strategy Group and North Star Opinion Research to survey public opinion on the national debt. The nationwide poll included 1,001 U.S. registered voters, surveyed by telephone between November 15, 2018 and November 20, 2018. The poll has a margin of error of +/- 3.1%. The poll examined voters’ opinions on the national debt, political leadership, and America’s fiscal and economic health.